Randy Kuba and his signature Kuba Awamori. Peace, Love, and Gratitude are most important to Okinawan people. So important, they infuse it into everything. Awamori is no exception. In various small villages of Okinawa, an awamori distillery is the heart that keeps the community thriving. The employees are a family that consists of people of all ages and abilities. When awamori is sent out to other parts of the world, they are sharing the same sense of oneness that it took to create it. Another example of how people in Okinawa support one another is through moai and yuimaaru. Moai is a tradition that believes in supporting one another and sharing one’s bounty when another is in need. Therefore, it is a group with the intention of creating lifetime friendships that provide financial and emotional support in the spirit of yuimaaru. Literally, yuimaaru means “connecting circle.” As an isolated island accustomed to typhoons, the Okinawans live by supporting one another in their “connecting circle.” Examples of yuimaaru and moai are everywhere as villages, farms, and of course, awamori distilleries. Randy Kuba, president and founder of Lotus Spirits, explains, “They realize their village awamori distillery is the key source of survival for many residents. Therefore, during the rice harvest, you’ll see young and old contributing. Their reward is taking a portion of the rice back to their families.” So delicious is rice eaten together that was harvested together as well! When Randy visited the land of his ancestors about a decade ago, it was the spirit of yuimaaru, a community coming together to create something out of love that stole his heart. His vision was to bring the heart of the Okinawan people to the world through the tangible means of awamori. “Awamori is not made to satisfy the alcohol demands of the market,” he explains. “It is not made by automated machines in a factory.” Instead, it is handcrafted by artisans who have passed it down for generations. 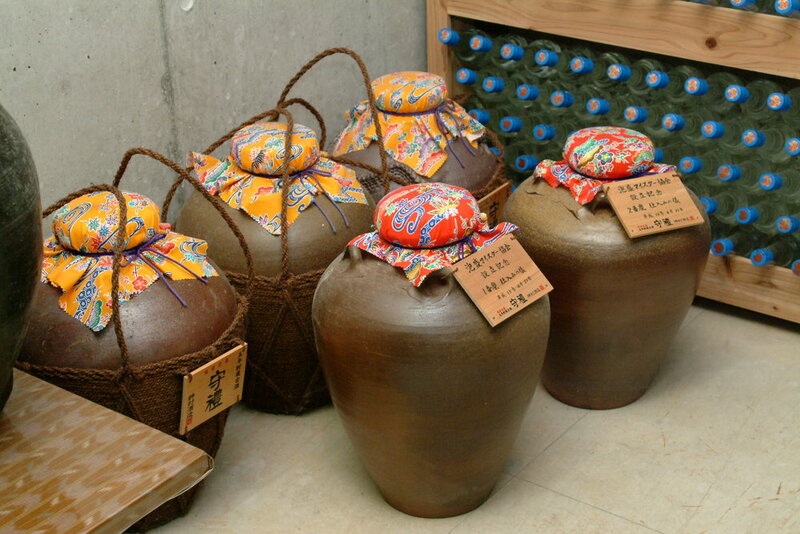 Awamori is a distilled spirit unique to Okinawa. The art of distilling and aging awamori is over 700 years old and known to be Japan’s first and oldest distilled beverage. The ingredients consist of Thai Indicia rice and “koji” which is a black mold indigenous to Okinawa. Because it is considered the most natural organic tasting spirit in the world, it can be paired with cuisine of all cultures. Vintage awamori that has been aged for three years or more is called Kusu. Okinawans say that producing and aging awamori is much like raising a child, increasing its character, flavor, and sophistication. Shochu, the cousin of awamori, can be made from potato, barley, rice or soba (buckwheat noodles), and therefore, the flavors and the aromas tend to be sweeter or more complex. Whereas awamori embodies elegant simplicity. The closest western counterpart to awamori would be vodka, however, it's only real commonality is the transparency. Although Okinawa, like all cultures, utilize their native resources, Thai Indicia rice is considered to be rare, and valued to have the highest and purest quality resulting in a unique sweet taste. This is also the result of Okinawa’s strong diplomatic ties with Thailand going back to the 13th century during the “Golden Years of Okinawa” when trade between Europe, China, and Indonesian countries flourished. Okinawa, being strategically positioned between all major ports, became the central trading center for staple goods. The Thai Indicia rice was dispersed exclusively to the elite within Okinawa. Using such a superior ingredient honors Okinawa’s ancient history of diplomacy, as well as, the relationships that are honored when such a heartfelt gift is given in today’s society saturated in mass production and instant gratification. The Kame is the key to aging awamori. These beautiful clay pots look like works of art, but it is the unique properties of the pot that make the storage and aging of awamori a continued process long after it leaves the distillery, until it is consumed. The kame is made of clay, and it is believed that because it comes from soil, it holds the grounding energy of Mother Earth. When it is transformed into a porous clay pot, free of lead and artificial elements, it breathes and sweats like any other natural living being — expanding and contracting as the temperature and climate vary. 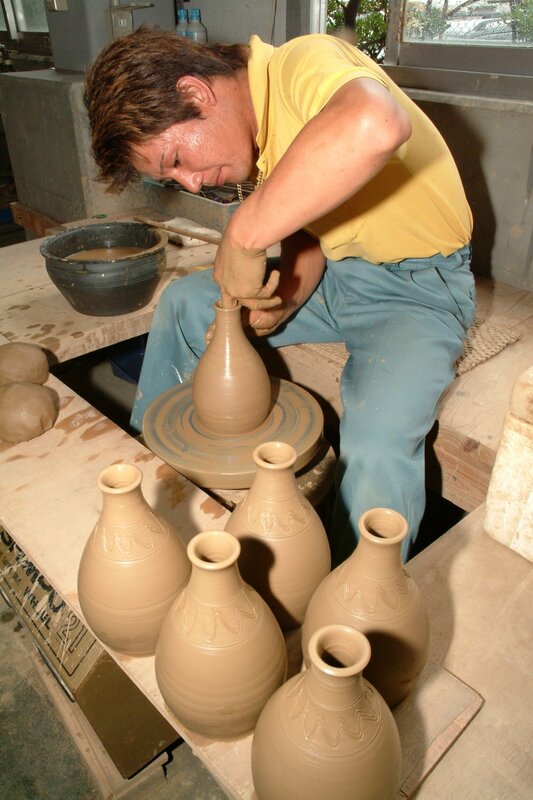 The art of crafting a kame that is part earthenware, which is able to breath, and stoneware to contain fermented liquid or water to be purified, is knowledge native to Okinawa. Storing Awamori in a kame connects the ikigai of the people with the grounding energy of Mother Earth producing an expanding energy greater than ourselves. As years pass, the awamori is nurtured by the kame and creates an essence of living substance that is unique, smooth, and balanced in aroma. In Okinawa, health does not refer only to the physical body. Our American ways has many of us focusing on diet, fitness, and medicines as a way to address our health. However, in Okinawa, spiritual alignment also influences well-being and longevity. To address only the physical part of the self is an incomplete science. Finding one’s ikigai (reason for being) creates happiness and meaning to life, and therefore, is an essential part of their daily practice. Observe a person whose life is in alignment with their ikigai, is physically active, and nourished with vegetables of various colors, such as, beni imo (purple sweet potato), goya (bitter melon), tomatoes, hechima (sponge cucumber), and leafy greens, paired with a glass of awamori, you begin to see the habits of how the Okinawans became known to thrive well into their centenarian years. The way Okinawans enjoy alcoholic beverages is different than in the United States. Respecting the power and essence of awamori, it is understood that if you consume too much, it will control you, but, if consumed in balance and moderation, it enhances the absorption of nutrients from whole foods that are consumed. Recently, a group of National Geographic scientists identified the “Blue Zones” around the world which had the highest life-expectancies. The purpose of the Blue Zones Project is to create a movement across the United States to adapt the habits of those who lived in those areas to the American lifestyle. The concepts of ikigai and moai are key principals of extending longevity. Social gatherings with friends and family with a moderate amount of alcoholic beverages is a great way to connect in a moai. Cuisine - As a basic cooking ingredient. It is commonly kept in the kitchen cabinet of homes among the spices, salt, and oils used in everyday cooking. It is also an excellent marinating sauce to eliminate toxins from pork, fish, or chicken. Moromi-su - A health tonic vinegar that is produced in the distillation stage of producing awamori. In Japan, about 70% of the population from karate practitioners to the everyday business man drinks a type of health tonic vinegar for the benefit of increasing stamina. Herbal Tonic - Okinawans add turmeric, honey, and garlic aged in an earthenware pot and to awamori as an herbal tonic. Sipping a little each night before going to bed is a regiment that supports longevity. Straight - When drinking awamori for the first time, it is recommended that you drink it straight so that you may enjoy the rich flavor and aroma of its pure ingredients. Any kind of glass will do. Enjoying Awamori in a wine glass will allow you to savor the aroma along with the taste! On the Rocks - With ice cubes or crushed ice in a chilled glass, this style of enjoying awamori is very refreshing. Mizuwari (diluted with cold water) - Also refreshing, you can control the strength of the alcohol to your liking by drinking Awamori mizuwari style without losing the taste and aroma. Oyuwari (diluted with warm water) - First pour in warm water, then the awamori. It is recommended you enjoy Oyuwari style at body temperature for optimum flavor. Get Creative - There are many ways to enjoy awamori, mix with soda water with a hint of lemon or lime, add your favorite fruit juice, herbal tea, or add to melted Melona bars with Sprite. It’s fun to experiment with awamori! Although there are 47 awamori distilleries in Okinawa (mostly partnered with a Japan company to produce in large volumes through automated machinery), the Kuba brand selects only the distilleries and kame craftsmen of villages that maintain the heart and discipline of their ancestors. From creation to consumption, awamori brings people together.When you hold your awamori kame, you are not just holding an elixir of pure, high quality ingredients, you are also holding a means to bridge people, family, friends, communities, and countries together. Awamori is created by hearts and hands which have infused their sense of ikigai, kaizen, moai, and yuimaaru. So when sharing such a high vibrational beverage, do so by celebrating with joy and gratitude among friends and family.